Anytime you go to the hospital, medical center, or physician’s office you receive a bill. Have you ever wondered who creates those bills? A Health Information Management Technician is who transcribes the bill correctly and does a variety of other health-related data.The career is one of the newest and hottest healthcare professions available today. And the overwhelming need for such trained professionals is forecast to grow rapidly. Is it this career for You? A Health Information Management Technician (HIMT) effectively manages and organizes health information data. They work to ensure that all health information is accurate, accessible, secure, and of the utmost quality. All records must be maintained in both paper files and electronic systems. A HIMT has to be familiar with the various systems used for classification to accurately code and categorize all patient information for the various databases and registries and to ensure insurance reimbursement. They also work with files on all patients’ treatment and medical histories. If you are looking for an exciting professional career working in a medical office then a position as a Health Information Management Technician might be ideal. The healthcare field is one of the fastest growing in the nation. As life expectancies increase the need for medical office workers continues to escalate. Integrated health systems will continue to grow and increase in complexity which means that the need for technicians will also become even more critical. One of the key perks of becoming a HIMT is that you get to help people without having to attend college for a decade to become a doctor or having to have a hands-on approach as a nurse. Hospital and medical care staff play a vital role in making sure that patients are satisfied and understand the entire billing process. They also garner valuable revenue for the healthcare facility in order to keep it all running smoothly. In your role as a HIMT, you will be needed and play a vital part in the lives of your co-workers and patients. This is sure to provide you with a true sense of career fulfillment. What Type of Environment Does a Health Information Management Technician Work Within? The work environment for a HIMT usually consists of an office that may or may not be private. You might have your own private office or you could be situated in office cubicles. The workday is spent sitting at a desk in front of a computer for long hours. On rare occasions, some Health Information Management Technicians’ may work remotely which gives you the added benefit of working from home or some other location. Much of your time is spent working alone on various computer programs. Most Health Information Management Technicians work full time. The majority of hospitals and medical centers are open 24-hrs. In such circumstances, you may be expected to work various shift schedules such as evenings and overnight shifts. You might also have to work on the weekends. Typically, you will work a 40-hr work week. It is rare for the position to require overtime. You will reap many benefits such as employer-provided insurance, paid vacation, sick days, and most employers even offer various retirement plans such as 401ks. Large medical centers frequently have employee daycare which is an added bonus if you have or plan to start a family. If you want a career that is stable and provides a good salary then a HIMT is a great choice. As of March 2018, the median annual salary for a Health Information Management Technician was $34,160. Depending upon the area of the country and work location, the salary typically ranges from $25,070 to $41,600. The Bureau of Labor Statistics projects that the need for Health Information Management Technicians will increase at a faster than average rate when compared to other other jobs in the healthcare field. All areas of healthcare are growing fast but the HIMT is forecast to have an average growth rate of 13 percent over the next few years. There will be more than 40,000 jobs in the field opening up. As the population grows older and life expectancy increases, the healthcare career demand will only burgeon with the need for trained individuals. This means that you will have ample job opportunities in virtually any area of the country. Skilled healthcare workers are in great demand so you will be able to pick and choose which position works best for your lifestyle needs. You might be wondering what a day in the life of a HIMT is truly like. Well, your duties will be very diverse and well-organized. A majority of your time will be spent reviewing patient records. You will be required to check the records for completeness, accuracy, and the overall appropriateness of detail. All patient outcomes must be tracked and analyzed for quality. One of the most important aspects of the position is maintaining and organizing all patient files both electronically and on paper for clinical registries and databases. You will be working closely with classification software to enter all clinical codes and ensure that insurance reimbursement runs smoothly and is assigned accordingly. Classification software also lets you analyze all the data. Your job will include electronically documenting all patients’ symptoms, examinations, test results, treatments, medical histories, and healthcare services which means you need to be extremely precise and pay close attention to details. When working in any healthcare field, confidentiality is of utmost importance. It is true that the majority of your day will be spent performing solitary work on a computer but you will occasionally need to confer with nurses, physicians, and other healthcare professionals to clarify diagnoses and procedures to ensure that all records are accurate and complete. A career in HIMT means that your day will be spent working with electronic health records (EHRs). EHRs are always changing and evolving so this means that a Health Information Technician must also be willing to learn quickly and adapt even on the job to newest and latest computer programs and technological requirements of the career. HIMTs’ must be able to learn new EHR computer software, plus follow everchanging EHR security and privacy practices that are instigated to improve the healthcare field and information systems. Who Employs Health Information Management Technicians? As a trained HIMT you will have many options on where you can work. This means that you can choose a more laid-back healthcare facility or a large, thriving medical center. You can also opt to work in a small physician’s office where you can form close bonds with your co-workers. Hospitals such as state, local, and private. Health information technicians may also want to specialize in various aspects of the health information field. Many will also opt to work as medical coders, often referred to as coding specialists or as cancer registrars. At CBT College you can pursue your dream of becoming a Health Information Management Technician. The necessary Associates of Science in Health Information Management Technology at CBT College is designed to give you a firm knowledge base and all of the technical skills that you will require to successfully manage, maintain, process, identify, and store health information. CBT College at the Cutler Bay location offers the accredited Health Information Management Program by the Commission on Accreditation of Health Informatics and Information Management Educations (CAHIM). Once students graduate from the Cutler Bay location they then become eligible to apply to take the AHIMA/Registered Health Information Technician (RHIT). Upon completion of the Health Information Management Technician program at CBT College, you will be ready to confidently seek a career in the healthcare field. Your success at finding employment depends on a variety of factors but, in general, the Graduation Satisfaction Rate for the HIMT Program in 2012 to 2013 was 75 percent. The institute is nationally accredited by the A.C.I.C. S. They are also licensed by the Commission of Independent Education and certified by the U.S. Department of Education. At CBT College you will find affordable career training that is strongly focused on technology and science. The institute offers not only outstanding educational opportunities but also hands-on experience so when you complete your courses and obtain your degree/certifications you will be fully trained and ready to work as a HIMT. Contact us to Learn More About Our Associate of Science in Health Information Management Technology degree program. 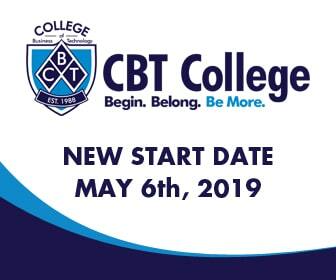 If you are interested in taking the steps needed to attain a career as a Health Information Management Technician then apply today or call 305-783-2809 to learn more about CBT College. Our knowledgeable admissions staff will go over our programs so you know exactly what to expect and how to make your dreams a reality.